Presenting Handcrafted wooden pieces embellished with Dokra which makes a beautiful piece for Home Décor. The range includes -Wall décor, Artefacts, Dokra Box holders, Napkin stand & Lots more. Started by Priti Pishwikar, a design studio that loves experimenting with weaves, textures, threads, and other design elements. Their contemporary designs are inspired by nature and our cultural heritage. The ethnic range includes Sling Bags, Tote Bags, Clutches and Hand bags. Wumaniya uses traditional handicraft in a contemporary form to design a range of Apparels. You will find an extensive range of Blouses, Skirts and Jackets in Gotta Patti, Phulkari & Embroidery work like Karachi, Kutchhi, & Kantha. 4. Icing on Top – Confectionery for the ultimate dessert lovers! Tantalize your taste buds with assorted range of Cookies& Crackers. Perfect snacks to stock up before festivals begin! ‘RakshaBandhan’ or ‘Rakhi’ is a special occasion to celebrate the emotional bond between a brother and a sister. We are celebrating this beautiful festival by offering Chocolate & Rakhi gift boxes. Shop through a wide range of Hand woven Tussar silk Sarees. Available in vibrant hues the collection is a must have in your wardrobe. So go on & visit our store to drape up in style with beautiful & elegant sarees. Shyam is a mix of black & White Designer Kurtis which gives a charming look to the attire. This Festive season make a style statement with this suave range of ethnic elegance. So what are you waiting for! Visit us and indulge in the joy of festivities. 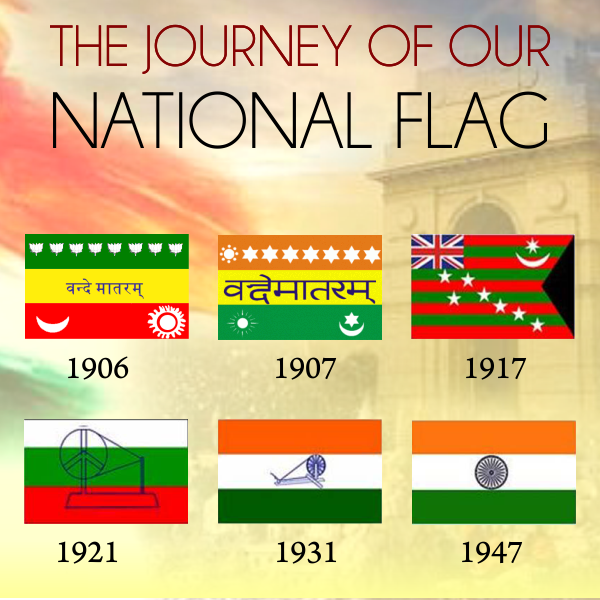 – 1906: The first national flag in India is said to have been hoisted on August 7, 1906, in the Parsee Bagan Square (Green Park) in Calcutta now Kolkata. It is a horizontal tricolor of dark blue, yellow and red. The upper blue stripe has 8 stars of different points. These represented the various state of bloom of lotus flower. The middle yellow stripe has “Vande Mataram” written in Devanagari script. The lower red strip has a sun and a star and a crescent on each end. – 1907: The second flag was hoisted in Paris by Madame Cama and her band of exiled revolutionaries in 1907. The 8 stars-lotus in these flags represented the 8 provinces of British India. There are other variations of these flags. One such flag had all the stars, sun, star and crescent hand embroidered. – 1917: The third flag went up in 1917 when our political struggle had taken a definite turn. DR. ANNIE BESANT and LOKMANYA TILAK hoisted it during the Home rule movement. 1921: During the session of the All India Congress Committee which met at Bezwada in 1921 (now Vijayawada) Pingali Venkayya prepared a flag and took it to Gandhiji. It was made up of two colors-red and green-representing the two major communities i.e. Hindus and Muslims. Gandhiji suggested the addition of a white strip to represent the remaining communities of India and the spinning wheel to symbolize progress of the Nation. – 1931: A landmark in the history of the flag. A resolution was passed adopting a tricolor flag as our national flag. This flag, the forbear of the present one, was saffron, white and green with Mahatma Gandhi’s spinning wheel at the center. It was, however, clearly stated that it bore no communal significance and was to be interpreted thus. – July 22, 1947: The Constituent Assembly adopted it as Free India National Flag. After the advent of Independence, the colors and their significance remained the same. Only the Dharma Charkha of Emperor Asoka was adopted in place of the spinning wheel as the emblem on the flag. Thus, the tricolor flag of the Congress Party eventually became the tricolor flag of Independent India. – Karnataka Khadi Gramodyoga Samyukta Sangha based in Hubli is the only licensed flag production and supply unit in India. – The largest flag (21 × 14 ft) is flown by the government of Maharashtra atop the Mantralaya building, the state administrative headquarters.